(a) Using pliers, grip the claws of the clip and slide the clip, and disconnect the heater water outlet hose. 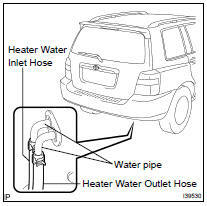 When installing or removing the hoses, hold heater water pipes to prevent deformation. Do not apply any excessive force to the heater water outlet hose. HINT: Disconnect the heater water inlet hose in the same way as the heater water outlet hose. (a) Remove the 2 clips and foot air duct rear. (b) Remove the 2 clips and air duct rear No.5. (a) Disconnect the washer hose clamp. (b) Remove the 4 bolts and plate. (c) Disconnect the heater relay No.1 clamp. (d) Disconnect the heater blower resistor connector. (e) Remove the 4 bolts and rear heater assy. (a) Using pliers, grip the claws of the 2 clips and slide the 2 clips, and disconnect the heater water hose. NOTICE: Do not apply any excessive force to the heater water hose. (a) Disconnect the 2 clamps and connector. (a) Remove the 9 screws and clamp. (b) Remove the rear heater unit sub-assy from the heater case. (a) Remove the nut and heater blower fan sub-assy. (b) Remove the 3 screws and heater blower motor sub-assy. (b) Install the heater blower fan sub-assy with the nut. (a) Install the rear heater assy with the 4 bolts. 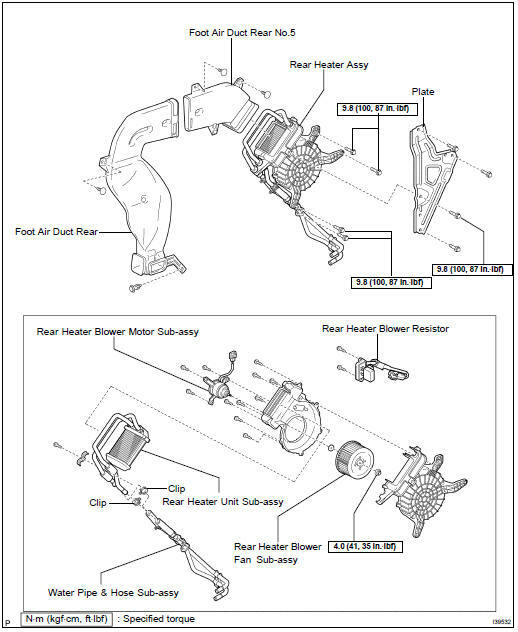 NOTICE: Tighten the bolts in the numerical order shown in the illustration to install the rear heater assy. (b) Install the heater blower resistor connector. (c) Install the heater relay No.1. (d) Install the waher hose. (e) Install the plate with the 4 bolts.